Back in 1997, I visited the town of Ramallah in the West Back to do volunteer work. I stayed at a Catholic convent, which also happened to be an orphanage. 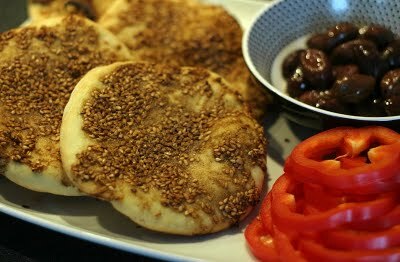 Every morning I would smell the nutty and fragrant za’atar spice, baking on fresh homemade bread called “manakish.” To this day when manakish are baking in the oven, I get memories of those sweet nuns who made me feel at home. Sometimes I am in the mood for this savory pastry but don’t have time to make the homemade dough, so I use either ready made store bought dough or even refrigerated biscuits. If you do choose the store bought option, make sure the ingredients are all familiar to you—hydrogenated fats are an absolute no-no in the Mediterranean/Middle Eastern diet. Zesty flatbread featuring Za’atar and feta cheese–pure yumminess!